A master of precision time, Tag Heuer has been a leading innovator in the development and design of high quality and high fashion watches. The Monaco, released in 1969, not only introduced the first automatic chronograph, but also the first square face to contain it. Steve McQueen sported the watch a year later and the timepiece has only been gaining in popularity since. 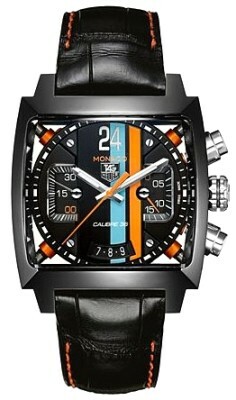 Tag Heuer’s Monaco CAL5110.FC6265 is a modern marvel, and a powerful watch. The idea of Swiss Avant-Garde design can be clearly identified in this model of the classic Monaco. Bright colors and futuristic design blend with innovative engineering to form a watch that is as much like a racecar as any watch could ever be. 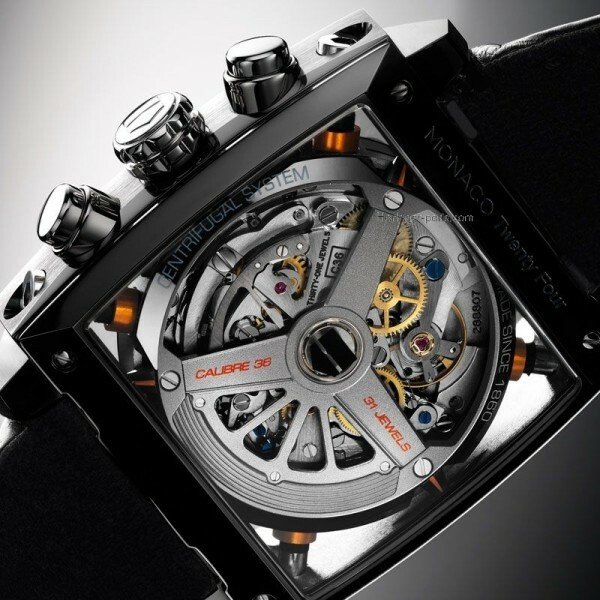 The Monaco CAL5110.FC6265 is powered by Tag Heuer’s Calibre 36 movement which beats at 36,000 beats per hour. That’s impressive enough, but it’s only the beginning. There is also an Advanced Dynamic Absorber system, which is composed of four orange, shock-absorbing arms that hold the movement and protect against any sort of shock. Most incredible is the see-through panel at the back of the watch dial, allowing you to see into the inner workings of one of the oldest and most delicate pieces of machinery—the watch. Opposite the window into this watches soul is a colorful and complex face. The black, circular dial contains no numbers or numerals regarding hours or minutes, but rather thick and thin white stripes to mark the hour and minutes, respectively. A polished rhodium makes up the hour and minute hands, complete with luminescent markers to display accurate time in the dark of night or the depths of the ocean. There is a bright orange seconds hand and small seconds in a half dial at the nine o’clock marker. And, of course, the Monaco includes the chronograph—minutes on a dial at the three o’clock position and hours at six o’clock. Finishing up the many timing mechanisms is the steel crown and two steel push-buttons on the right side of the square case, which is polished stainless steel coated in black titanium carbide. Finally, holding it all together, the band is black alligator with orange stitching. Tag Heuer’s Monaco CAL5110.FC6265 is an homage to racing, and, luckily, an homage that further innovates the function and design of the watch. Everything about this timepiece is a reference to the past, a nod at inspiration. The face, or round, black cover over the movement looks much like a steering wheel, and the large number twenty-four in the twelve o’clock position is for the 24 Hours of Le Mans race, the oldest endurance sports car race. Even the blue and orange color scheme cite a motorist influence as the Gulf livery on Steve McQueen’s iconic Porsche 917K in the movie Le Mans. The Monaco is a classic watch, but the CAL5110.FC6265 is difficult to read, defined by two bright colors that will likely clash with some of your articles of clothing, and extremely pricey. If you’re asking how much, and the answer matters, look at other Tag Heuer’s with a four- instead of a five-digit price tag. But, if you’re willing to sacrifice an ease of telling time for, truly, the most incredible example of watch engineering and a beautiful tribute to the sports car, then it is well worth spending the money on the Monaco CAL5110.FC6265 than on, well, an automobile.